One would think there might be a better way to get cool! Ductless mini-splits are the ideal air conditioning solution for installations where adding ductwork is impractical or too expensive. The matched combination of indoor air handler and outdoor condenser is efficient and easy to install. Single zone A/C units come in sizes of 9,000 to 30,000 BTUH total capacity. The indoor units can be mounted on any outside wall--a 2-3/4" diameter hole is all that's needed for connecting the two units. A mini-split opens the view from a window that might otherwise be blocked by a window air conditioner. The units are operated by LCD wireless remote controls and are packed with convenience and comfort features.Energy Knight single zone ductless mini-splits are UL and C-UL listed. For the full-sized system in your home, Andrews Mechanical, Inc. will utilize the best practices for maintaining the safety and longevity of your new system. Click on this LINK to see a photo of the"Andrews Access Port" that is placed ABOVE the coils to provide entrance for the technician (or owner) to clean and do regularly scheduled maintenence. The importance of this access port is to provide a means of cleaning the natural buildup of lint and airborne dust which is known to cause various illnesses such as Leagionaires Disease. The next and probably the most important part of choosing the correct airconditioner is the'sizing' of the air-conditioning unit. "It is generally accepted that "the right way" to specify an air conditioning system is to calculate the loads and select a piece of equipment that will provide comfort to the customer in a wide variety of conditions. Unfortunately this is rarely practiced." THE NEXT STEP IS THE INSTALLATION! LARRY says: " We at Andrews Mechanical, Inc believe the indoor coil should be in the factory case...(click here to learn how we Install)"
Using the proper values of temperature, both indoors and outdoors, Andrews Mechanical, Inc will properly assess the correct size air-conditioner for your application. This will make the homeowner / business owner (and the environment) much more comfortable as it will save them money both immediately and over time.Click here to view some terms that Andrews Mechanical, Inc uses when determining the size of your new air conditioner. 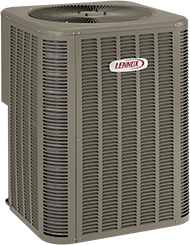 Andrews Mechanical, Inc. is a proud supplier of Lennox Air Conditioning products.